Watch any elite player and notice how effortlessly they swing the club. This results from an efficient swing and smooth tempo. The takeaway is considered the beginning of the backswing. Therefore, the swing starts with the correct set up and every movement that follows. Start the club head back “low and slow.” Low and slow is a very common phrase used to describe the takeaway. Jack Nicklaus is famous for stating the takeaway is the most important 18 inches of the golf swing while Bobby Jones said, “It is not possible to take the club back too slow.” Begin the takeaway by keeping the club head as low as possible for as long as possible. Many amateurs severely complicate their swing through excessive movements before the club reaches waist high. A common mistake occurs by picking the club up too quickly. Allow the swing to begin with the left shoulder and arm pushing the club back while avoiding any movements with the hands and wrists to start the backswing. 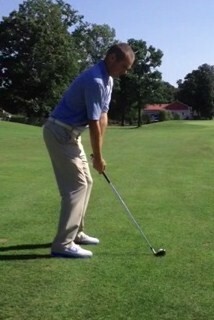 Also, keep the lower body, specifically the left leg and foot, stationary until the hands and club reach waist high. There should be very little movement at the beginning of the swing. 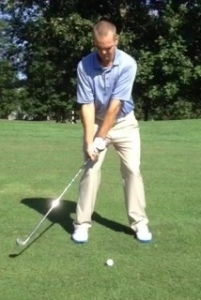 The body will create rotational movements once the club extends past waist high. Start the swing “low and slow” by keeping the club head as low as possible for as long as possible. Tempo is also a major concern for a repeatable swing. A slow and smooth start helps keep the correct sequence of movements. 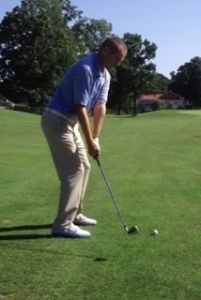 A quick takeaway can potentially pull the club and entire body out of position. Since you never hit the ball going back maintain a slow start and promote setting the club in a good position at the top of the backswing. This increases the likelihood of the club head returning to impact in a good position. 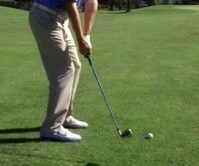 Several drills allow you to practice the correct takeaway either at the golf course or in the comfort of your own home. Without a club, begin by taking a normal set up position and allow your arms to hang down. Extend your left arm and hand back as if you are about to shake hands. The left thumb should point up toward the sky while the outside of the left hand points in front of you. The lower body should remain stable and not move throughout the drill. The drill positions the left arm and hand in the correct position approximately waist high and parallel to the ground. Practice the “low and slow” takeaway by a tee approximately 20 inches behind a ball. Set up in a normal position to the golf ball and swing the club back, focusing on striking the tee by extending the club head back low and slow. The goal is to swing the club back as low as possible for as long as possible. The club head should hit the tee to assure you are starting the backswing correctly. In addition, if the club head misses the tee to the right or left then the swing path is incorrect. If the club head swings over the tee then you picked the club head up too quickly. Focus on swinging the club head straight back the target line low enough to hit the tee. 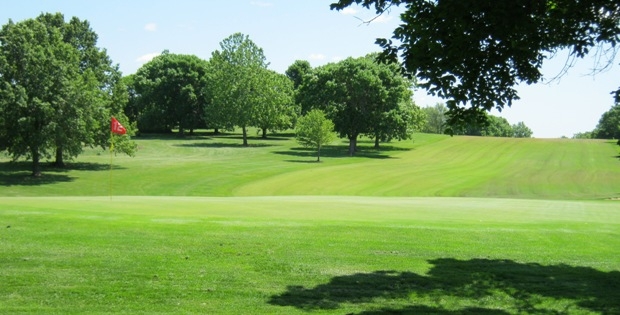 In the twelve years it has been on the Kansas City metro golf scene, Shoal Creek Golf Course has established a reputation as one of the finest public courses not only in the area but in the state. The 6,950-yard, par-71 layout was designed by Steve Wolford and rolls over and around a picturesque landscape just west of Liberty. In July, Shoal Creek will play host to the Kansas City Amateur for a fourth-straight year (sixth overall), and it also has hosted the PGA Midwest Section championships. The course has won numerous accolades, among them is recognition as the top public course in Missouri by Golf Card Traveler and the No. 2 public course in the state by Golf Week’s America’s Best. General Manager Brett Plymell first became a club professional when Shoal Creek opened in 2001, then came back as general manager in 2008 after three years at Adams Pointe – not that he didn’t enjoy his stint at the latter course, he said. “I’m partial to this facility,” Plymell said of Shoal Creek. “I really like it here, like the clubhouse, like the people. The chance to start at a new course is what drew Plymell to Shoal Creek initially. “The layout was very good, and the company I worked for, it was my first head pro job.” Obviously such a highly rated course has its share of challenges, but Shoal Creek won’t frustrate the average player into taking a links hiatus. The fairways often provide plenty of landing area, but several holes have tall trees on either side that can make testy follow-ups from wayward tee shots. “The back is a little more treed than the front, and Shoal Creek runs throughout the course,” Plymell said. While the front nine is devoid of notable water hazards, four holes require golfers to navigate doglegs with bunkers at the bend. Two of the final three holes are par 5s. No. 7 is the longest on the course, with a wide but shallow green. No. 9 can produce some long-rolling drives with its downhill slope on the fairway, but has a sharp dogleg to be dealt with on the second shot, as well as a large tree in the right side of the fairway as you near the green. The back nine begins much like the front, with a straightaway par 4. After a downhill par 3, water must be carried with your tee shots on No. 12 and the par 3 17th, while a pond hugs the fairway on the par 4 15th and can make the tee shot on 16 seem more intimidating than it should feel. The finishing hole is the longest par 4 on the course and can dogleg right into the wind. “When we first opened, instead of having a signature hole, we liked to say we have a signature par 3, par 4 and par 5,” Plymell said. 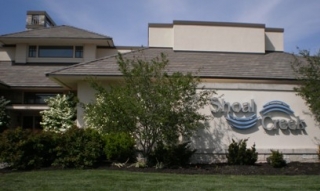 Shoal Creek is managed by Chicago-based KemperSports and owned by Kansas City Parks and Recreation. The two-tier practice tee has 25 stations, while the putting clock is 6,000-square feet – plenty of room to tune up for your round. The pro shop, with two PGA professionals on site, is part of an 11,000-square foot clubhouse that’s available for casual dining, corporate and charity events and receptions. Throughout the summer, the club hosts a series of junior golf clinics and camps. With options for kids ranging from age 6 to 18, there is an opportunity to learn the game and have fun. The clinics run about 90 minutes each day of the session while camps are either half day or full day. Full day camps provide the added benefit of a 9-hole round after a morning of instruction. Plymell added the club recently installed new touch screen GPS screens on the carts and tries to keep the pace of play moving by limiting groups to four players and staggering tee times. “The layout and the conditions and service we provide – we try to make it feel like a private club,” Plymell said. The putter is the most used club in any golfer’s bag and the art and practice of putting is a critical part of the golf game. It stands to reason, then, that a golfer’s putter is such a critical tool and one that most either love or hate (and sometimes both). Like all golf equipment, putters continue to use new technology and new materials. While a putter can only be as good as the golfer wielding it, some of the new offerings from the major manufacturers are worth a look if you have to be falling out of love with your flat stick. 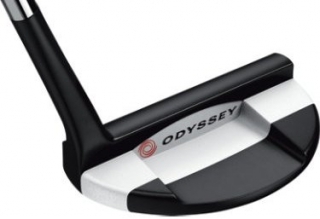 Odyssey is certainly a top manufacturer of putters if not THE top manufacturer. 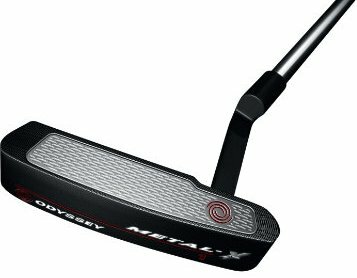 Their new Odyssey Metal-X series come in about a dozen different head designs and all feature a new special insert on the face that provides a crisp metallic contact with the soft feel of a urethane insert seen on a lot of their popular putters. That’s because the Metal-X insert features two layers: a urethane inner layer to provide the soft feel with a 6061 aluminum outer layer that contacts the ball. But that might be understating it a bit. That aluminum layer is riddled with oval depressions that supposedly grip the ball (they say it’s a “mechanical lock”) and its dimples to promote a smoother, more pure roll with less skidding. Less skidding means a more consistent roll, which of course, is something all golfers desire. Odyssey’s other new line of putters is their Odyssey Versa. The Versa’s main attribute is its color scheme. Each of the head styles in this series feature their Visionary High Contrast Alignment, which is an impressive way to say they have bold white and black contrasting finishes. Those color schemes are designed with the head shape in mind to help golfers perceive the face angle at address and throughout the stroke to improve alignment and get the ball rolling on line. All Versa putters include their newly improved, and always popular White Hot insert. A final option from this manufacturer is their Odyssey Tank putter. If that sounds like a heavy name for a putter, you’re right. The Tank is aptly named due to a 30 to 40 gram counterbalance weight in the shaft (weight is determined by the overall putter length) and a heavier 400 gram putter head. This additional weight throughout the club is designed to quiet the hands and engage the bigger muscles to promote a smoother stroke. Another benefit is that a putter with additional weight has a much higher Moment of Inertia (MOI), meaning it resists twisting on strikes with the toe or heel. The putter literally is like a tank, powering through the ball and providing consistent distance regardless of where the ball is struck on the putter’s face. The Nike Method Midnight includes the Polymetal Groove technology on the face that has made the original Method putters so effective and popular. This technology uses urethane and a grooved face to also provide crisp contact with a soft and responsive feel. 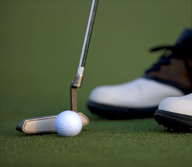 The grooves improve roll too, by imparting overspin that reduces the amount of skidding – and skidding, as noted earlier is not what a golfer wants on any putt. Tungsten heel and toe weights improve the putter’s overall forgiveness and it comes in a variety of head shapes in varying lengths. The most notable and visible feature is the dark nickel/chrome finish that just looks cool and distinctive. 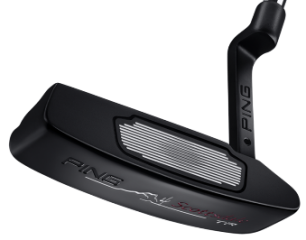 Another great putter series is the Ping Scottsdale TR. They come in twelve different head designs and the “TR” stands for “true roll.” According to Ping, true roll is what happens when a ball is struck due to the variable depth grooves found on the face of these putters. Deeper in the center and gradually shallower as they move outward, they are designed to provide better and more consistent distance on miss-hit putts. They even went so far as to test it – hitting putts on nine points across all parts of the putter face. That testing revealed a 50% increase in the consistency of the speed that balls left the putter. The insert on the face of the putter is made of lightweight aerospace grade aluminum that feels like a solid milled steel putter but distributes more weight to the heel and toe to improve MOI. 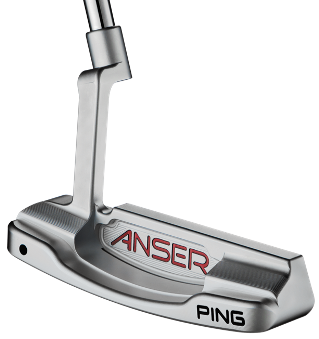 The Ping Anser series of putters have been around for at least a couple of years but are still great performing, beautiful clubs. They are completely machine milled from 303 stainless steel with a traditional and stylish satin nickel finish. The putter has some slight milling markings on the heel and toe to eliminate glare. The Anser, like other Ping putters comes in a variety of heads and styles each designed specifically for different putting strokes. Whether you putt along a strong arc, a slight arc, or putt straight back and through, there is a putter style to match. Just figure out which you are (or get a professional fitter to help) and then look for the color code that matches. Titleist and their Scotty Cameron series of putters are popular and recognized as fantastically crafted, great performing putters. The Titleist Scotty Cameron Select series comes in five different head styles that are precision milled with a beautiful “Black Mist” finish. 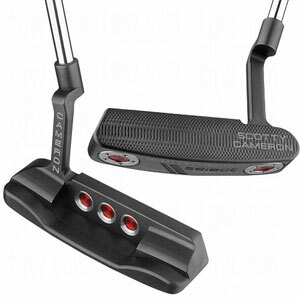 Scotty Cameron putters typically have come in a bright steel finish, so this new look is a welcome variation some will find appealing. The face is deep milled, meaning it has milling grooves and marks that soften the feel of the all steel face. The putter head features heel and toe weights that vary based on the head design and shaft length to provide the right amount of stability, or they can be swapped out with heavier or lighter weights to match a player’s preference. The new Yes! 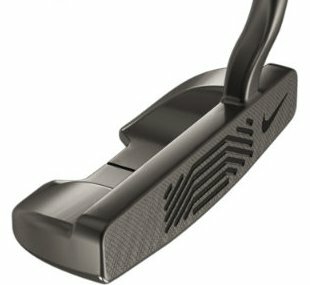 i4-TECH series of putters look a lot like the Yes! putters most golfers are familiar with, but with one noticeable difference, the finish. The new antique finish is copper-colored and lends a certain elegance and richness to its appearance. Another new feature that is less noticeable is the “through slot” that has been seen in other clubs, including drivers, fairway woods and hybrids, and now irons. In a putter, that slot and its thermoplastic polyurethane insert are designed to improve feel by dampening vibration. Of course, being a Yes! 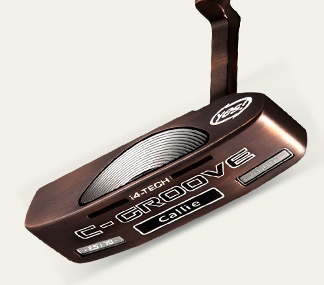 putter, it features the C-Grooves that has been found in all Yes! putters since their introduction. Those grooves are designed to impart overspin on the ball and reduce the skidding we noted throughout this article as a bad thing for putting. Run your finger along those grooves and you’ll feel that they are angled upward and a bit sharper than you would think. That design is all part of their signature style and why those putters are so effective. Next time you are on the golf shop’s practice green, grab a few of these putters and check out their features described above. All of them have certain designs to help make you a better putter and make more putts. Whatever appeals to you, find a professional to help get the right fit and start pouring more into the center of the cup. 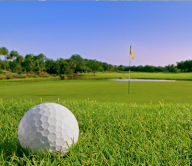 When it comes to standout sports venues in Wyandotte County, Sunflower Hills Golf Course is the golfing equal of the NASCAR track and the new soccer stadium. 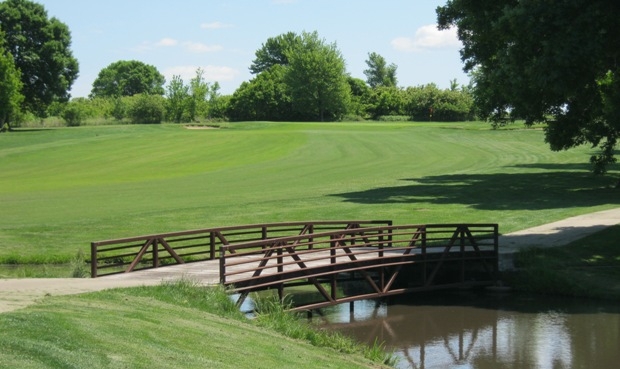 Opened in 1977, Sunflower Hills is among the most scenic and challenging golf courses in the Kansas City area. It is a rolling, wooded layout where no two holes are alike. The course will test a player’s accuracy and distance, but it has five sets of tees to suit everyone’s game. The course is set up virtually the same as it was 35 years ago, but got a makeover in 2003 with zoysia fairways, new cart paths and a new watering system, said Jeff Johnson, manager and PGA pro at Sunflower since 1981. The course is in top condition, with true putting surfaces and manicured fairways. Sunflower Hills is just north of Interstate 70 east of Highway 7 in Bonner Springs. It is only a few minutes from the freeway exit yet offers golfers the feeling of being in a more remote location, especially on the secluded front nine. Public land, mostly woods, surrounds the course. “That’s one of the things we hear a lot from people about why they come out here – no houses on the golf course,” Johnson said. Sunflower is also about course management off the tees and fairways due to the number of doglegs (six) and the abundance of trees. A ball put in the wrong place can require punch-out shots rather than open shots to the green. Johnson said trouble is especially prevalent along the left side. Sunflower is long off the back tees at 7,032 yards and no cinch from the next set at 6,659 yards. The other two mens’ tee sets are 6,030 and 5,838 yards and the women’s tee is 5,107. Slope and course ratings are relatively high. The first two holes are flat, unlike the rest of the course. No. 1 is a straightaway but long par 4 followed by a slight dogleg par 5 second hole that Johnson says is the easiest par 5 on the course. A long par 4 and relatively short par 3 and par 4 follow. These first five holes are the place to score at Sunflower. “From the 6th hole on is where the course really starts,” Johnson said. Fairways get tighter, longer and hillier. But each tee box gives players a good view of the best landing areas. For the most part, drivers can be used off the tees even though there are plenty of doglegs. On the back, Johnson calls holes 12 through 17 “our amen corner” because they are difficult. The holes are generally long and undulating. “Our most difficult hole is 15,” Johnson said of a hole the plays either as a par 4 or par 5. It is 480 yards from the back tee and 432 to 464 yards from the other four mens’ tees. The green has a lot of breaks in it and is a challenge to read, he said. There is water on holes 13, 14, 16, 17 and 18. The 18th hole, though, gives players a chance to finish strong after the six tough previous holes. The hole is a par 4 that measures just 260 or 270 yards from the forward tees and 350 or 361 from the two rear tees. In general, Johnson said golfers who have played Sunflower before have an advantage over newcomers – more so than on some courses. “Its about knowing where to miss it and reading the greens,” he said. Sunflower offers a rustic clubhouse to kick back and review the round over beverages and food. A large deck overlooks the ninth hole. Sunflower has a large practice range just a few steps from the first tee. Lessons are available. 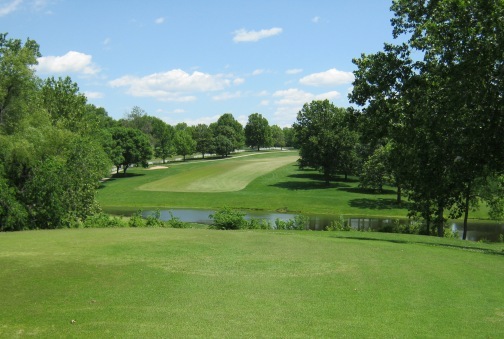 A wide range of affordable green fees are offered at Sunflower, listed on the website of the course at wycokck.org. Seniors, juniors and patron card holders get discounts. Sunflower has the largest senior golf league in the area, with about 160 participants, Johnson said. Seniors not only enjoy the course but the pace of play, Johnson said. The course also hosts group outings, tournaments and special events. Since 2001, Sunflower has had a six-hole par 3 course for youths and beginners. Players check in at the Sunflower clubhouse. The small course is a very short drive away. Green fees are just $5 for adults, $1 for kids. Johnson said the course has proven to be a very popular alternative to the main course for kids and players just starting out. Sunflower’s pro shop has a full line of golf clothes, equipment and supplies. It also offers club repairs, new grips shafts and other services. Sunflower Hills is owned by Wyandotte County. Its phone number is 913-573-8570. The address of the course is 12200 Riverview Avenue, Bonner Springs, KS 66012.